Thanks to some unexpected extra space, we secured a last minute invitation to go skiing at Okemo Mountain and Ski Resort in Ludlow, Vermont. Taking baby on a ski trip was far more difficult than going by ourselves ever was. 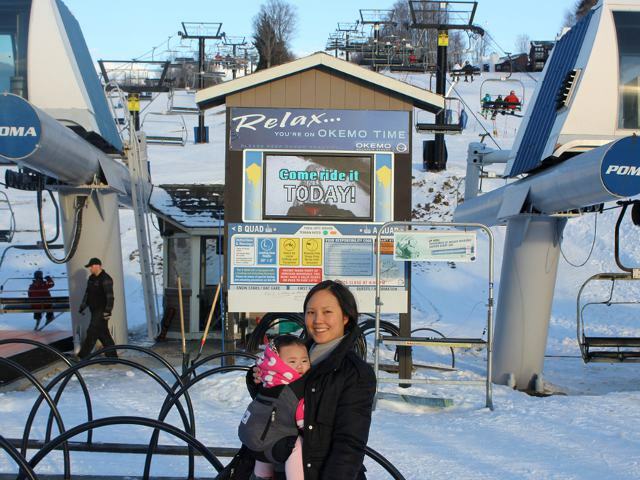 Nevertheless, going to Okemo Mountain with a baby was still a fun way to spend a long weekend. Mommy and I had two major concerns before deciding whether to go on a ski trip with our baby. First, we needed to know that the house where we were staying could comfortably accommodate the three of us without being an inconvenience to our friends. Second, we needed to know if there would be a safe, licensed daycare facility close by to enable us to ski together while someone watched Arya. Our friends assured us that we would be able to figure out a comfortable sleeping arrangement even with Arya and all her stuff. We also figured out that Okemo Ski Resort has two daycare facilities (one at each base camp) immediately on-site as part of their resort. With housing and daycare settled we were able to focus on packing for daycare, packing for the ski trip, and getting ready for the weekend. We ended up staying at a great house within a mile of the base of Okemo Mountain. Even better, the house was near the free ski shuttle route which dropped passengers off directly at the skiing base camp. Although it was quite old, the house had an adequate number of rooms, good heating, and a mud room large enough for everyone’s ski and snowboard equipment. Since our friends were considerate (and probably because they wanted to get as much sleep as possible), they let the three of us have a larger room with enough space for all of our stuff and Arya’s playpen. Both Mommy and I were a little nervous about sending Arya off to baby’s first day of daycare so we decided to ski one day with Arya in daycare, then spend the second day snowshoeing with baby. As evident from their website advertising, Okemo targets families with young children and provides a host of family-friendly services. The prices for all of the ancillary services are higher than non-resort areas. But for us the availability of the services dictated whether we would go skiing at all this season. As with most things at a ski resort, the specific cost was less important than the ability to go. We also worked the price into our budget since we were able to drive to Ludlow from Boston and were sharing a house at $50 per person per night as opposed to the $200 per person per night for staying on the mountain itself. Okemo allows 2-year olds to take private lessons, 3-year olds to have a group mini-lesson, and 4-year olds and up to have traditional lessons. Daycare is provided as an option for babies as young as 6-months up to 4-year old children. Older children ages 7 and up have opportunities for other specialized types of lessons and advanced instruction. 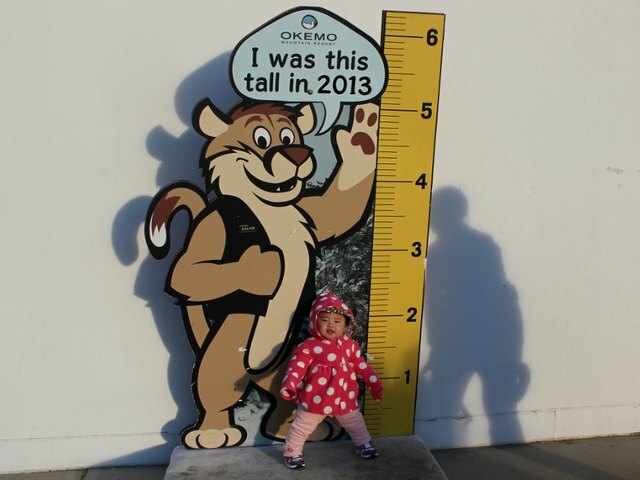 We would have loved Arya to be able to take a short lesson or get more exposure to skiing since both Mommy and I want to go as a family in the future. Since since Arya got to experience playing in the snow, her first day of daycare, and snowshoeing with Mommy and Daddy, we still think she had a memorable trip.